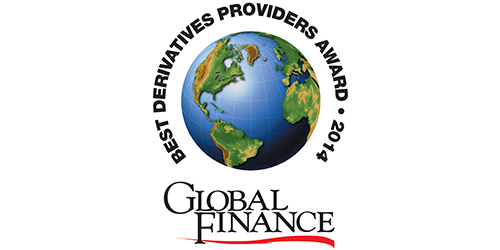 NEW YORK, October 30, 2014 — The editors of Global Finance have announced the winners of its Best Derivatives Providers awards for 2014. A full report on the awards and the winners will appear in the December issue of Global Finance. This is the tenth year Global Finance has selected banks and exchanges as winners and the third time the awards have been presented as part of our Best Global Risk Management Awards report, which honor the entire universe of risk management, insurance and derivative providers. Global Finance’s editors based selections primarily on in-depth interviews and email exchanges with end users of derivatives. Among the sources were financial research analysts, traders, risk managers of financial and nonfinancial corporations, as well as portfolio managers of mutual funds and hedge funds, with an emphasis on funds and corporations that have distinguished themselves with relative outperformance since the global financial crisis of 2008. Providers also had the opportunity to submit entries for consideration. Sources considered a range of subjective and quantitative criteria—such as product innovation, the quality of information that providers supply in the process of executing a deal, the breadth of liquid names in which a provider makes markets, a provider’s willingness to use its own balance sheet to offer liquidity to a client, and the inclination of a provider to step into the breach in a high-risk situation. in a year marked by increasingly unpredictable swings in the equity, commodities and currency markets. “Corporates have won an important exemption in the US from the need to post collateral against derivatives used for hedging. Nonetheless, derivatives market participants continue to work through all of the current and upcoming regulatory reforms worldwide and what it will mean for their businesses, and that of their clients. Our winners are those who have the confidence of their clients as they face the challenges ahead,” said Joseph D. Giarraputo, publisher of Global Finance. Download PDF below for the full list of winners by type of product, region, and exchange awards for Performance and Achievement.